Joanna Trollope's 1988 novel explores the politics and personalities of a fictional cathedral and its choir. In the precinct of Aldminster Cathedral, crisis looms. After already spending a great deal of money on a restoration of the cathedral organ, leaks in the roof are discovered requiring a major and expensive renovation. Hugh Cavendish, the urbane and worldly Dean, wants nothing so much as to restore his beloved Cathedral - even if it means sacrificing the Choir School to pay for it. Alexander Troy, the school’s headmaster, is determined that nothing and no one - certainly not the overbearing Dean – shall destroy the Choir. As the rift widens, many others are caught in the schism including Leo Beckford, the brilliant but wayward organist fighting off the unwanted attentions of Ianthe Cavendish, Dean Cavendish's rebellious daughter; Nicholas Elliot, an Old Boy down on his luck and searching for a purpose in life; the Bishop trying to soothe the angry protagonists without taking sides; Sally Ashworth, mother of the leading chorister, fighting loneliness and an absent husband; and Henry Ashworth, whose sublime treble voice may hold the key to saving the choir. In 1995, this book was adapted by BBC into a TV miniseries staring Real Life choirboy Anthony Way as Henry Ashworth and Nicholas Farrell as Leo Beckford. Cast the Expert: The BBC TV miniseries adaptation casts St Paul's Cathedral chorister Anthony Way as a chorister for the fictitious Aldminster Cathedral Choir. Chick Magnet: Leo Beckford is a mild example. He seems to have a knack for attracted unwanted female attention. In addition to Ianthe Cavendish, his Backstory mentions a Hot for Teacher student at an all girls school whose unwanted attentions led to him getting fired. Defictionalization: In the story, Henry's record become a hit, helping save the choir. 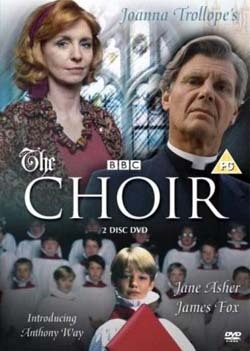 The BBC TV adaptation featured Real Life chorister Anthony Way of Choir of St Paul's Cathedral, London. The soundtrack went platinum and he became a star, with an additional four solo albums and three singles to his credit, plus solo parts on his two albums produced by his own choir. Disappeared Dad: Alan Ashworth, father of Henry and husband to Sally, is overseas working for most of the movie. His frequent absences and (in the book) infidelity strains the Ashworth marriage. Fake Band: The fictional Choir of Aldminster, played by a Real Life cathedral choir. Good Adultery, Bad Adultery: Sally Ashworth's affair with Leo Beckworth is depicted sympathetically, as her husband is frequently absent both physically and emotionally, and it is strongly implied that her husband is a unfaithful. She eventually divorces her husband and marries Leo, however the scandal forces Leo to resign and take up a position with another choir. Goth: Cosmo Cavendish affects gothic styles, mostly to upset his parents. Happily Married: Almost entirely averted. One could say that unhappy marriages are one of the themes of the book. Troy Alexander has probably one of the best marriages in the book, and even that is strained because his wife frequently disappears for weeks on end. Leo Beckford divorced prior to taking on his job at Aldminister. Little Boy Blue Note: The top line (treble aka soprano) of the Alminster cathedral choir is sung by boys. Henry Ashworth helps save the choir by recording a record that proves to be a major hit. NEET: Nicholas Elliot, at the beginning of the book, is unemployed, has no family to speak of, had recently been kicked out of university, and shows up at Aldminster looking a place to stay. No Party Given: Averted in the book version (several characters were explicitly identified as Labour or Conservative) but played straight in the TV version. One-Gender School: In the movie version, the school starts out as an all-boys school, however the vote to include female students takes place during the story. The choir remains all-male. The book version also mentions an all-girls school where Leo Beckford works in a addition to his duties at Aldminster. Saving the Orphanage: The characters have to find a way to save the cathedral choir when financial problems threaten its existence. Stalker with a Crush: Ianthe Cavendish has a crush on Leo Beckford, who does not return the her feelings. The Cast Showoff: In a way. For the TV version, the cathedral choir was played by a real choir, and Henry Ashworth by a real chorister who was an expert soloist, so of course many opportunities are provided to show off vocal talents. This does not distract from the story but was a key component of the original book, and also led to the soundtrack becoming a platinum album. Woman Scorned: Ianthe leaks the news of Leo's affair with Sally to the press, because she feels scorned by Leo. This page was last edited on 4 April 2017, at 16:00.